Resin and photoetched kits from Poland. PART also produces an extensive line of photetched brass detail sets. A002 Polish Cargo Truck URSUS A Mixed resin and brass. A003 Polish Cargo Truck URSUS A-30 Mixed resin and brass. A004 TK-3 Polish Tankette Mixed resin and brass. A005 TKS Polish Tankette Mixed resin and brass. A006 TKW Polish Tankette Mixed resin and brass. A007 TK/TKS Ursus A Tank Transporter Mixed resin and brass. A008 Tatra Armored Rail Car Mixed resin and brass. A009 T-27 Tankette Mixed resin and brass. P72-003 M3A2 Half Track Hasegawa Includes additional parts specific for this version. P72-004 M4A1 Half Track Hasegawa Part 1. P72-004A M4A1 Half Track Hasegawa Part 2. P72-015 M1A1 Abrams - Mine Plow Revell Mine plow only. Does not include parts from set 72014. 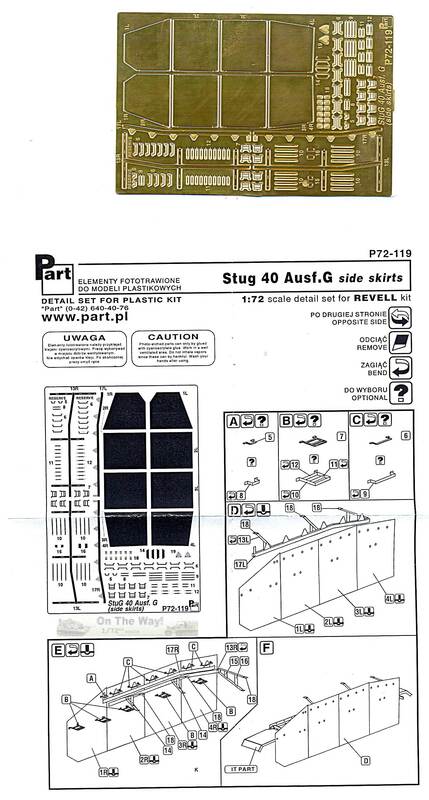 P72-019 Pz IV J Side Skirts Fujimi 1/76th Scale mesh skirts. P72-095 BT-5 UM Much of this set could also be used (with modification) for the Modelkrak kit. P72-096 BT-5 Tracks UM Could also be used with the Modelkrak kit. P72-100 BT-2 wheels UM Much of this set could also be used (with modification) for the Modelkrak kit. P72-101 BT-2 Wheels UM Replacement spoked wheels. P72-123 BT-7 Tracks UM Should also fit Modelkrak.